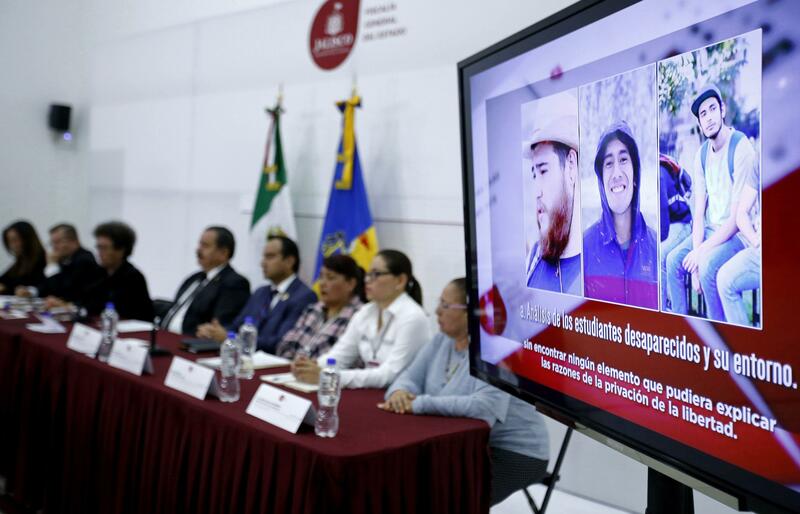 MEXICO CITY -- Authorities in the western Mexico state of Jalisco said they believe three film students missing since last month were killed and dissolved in acid. The students were abducted March 19 on the outskirts of Guadalajara after working on a film project for school at a location that was apparently being watched by members of the Jalisco New Generation cartel. The students were taken to another location where one was beaten to death, authorities said at a news conference Monday. Then the other two were killed. Prosecutors said the bodies were taken to a third location, where investigators believe they were dissolved in sulfuric acid. Criminals had confused the students with members of a rival gang, authorities said, according to the Reuters news agency. They were last seen after their car broke down, according to Jalisco state prosecutors. "Their bodies were dissolved in acid so that no trace of them remained," the state prosecutors office said. Two men have been arrested and there are arrest orders for four others in the case, according to the Jalisco Attorney General's Office.